NEW YORK, October 25, 2016 /3BL Media/ - Companies want to do good for their nonprofit partners through their pro bono programming. But, many companies know that they need an improved approach to social impact measurement to better assess the value of their services. Taproot Foundation and True Impact recognized the lack of pro bono program measurement standards and common confusion over how to measure the effects of pro bono service. Together, with support from Mastercard, they demystified this issue by developing a practical guide for corporate social responsibility (CSR) professionals. This new resource will help corporate pro bono practitioners seize opportunities to better tell the story of their impact on the nonprofits they serve, validate their investment, and continuously improve their offerings. 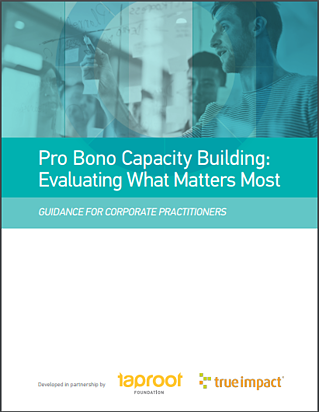 Companies typically evaluate pro bono programs by capturing data points, such as the number of volunteer hours logged or the number of employees engaged. However, when companies focus on capturing outcomes, they will be better equipped to understand the extent to which their pro bono investment improves nonprofits’ ability to carry out their missions. 1. Social performance: The pro bono intervention increases the effectiveness of the organization’s services or their ability to serve (reach) more beneficiaries. 2. Financial performance: The pro bono intervention helps increase revenues or reduce operating costs. “A practical, outcomes-based measurement framework is key to ensuring accountability and continuous improvement for any initiative. This guide offers a simple and effective way to bring that to pro bono programs—to prove value, identify opportunities to do better, and align internal and external stakeholders,” said Farron Levy, President and Founder of True Impact. This paper was made possible through the generous support and partnership of Mastercard.